The Lunch Pail Restaurant and Deli is not just for lunch. We are open through 7:00 AM through 7:00 PM, Monday through Saturday and Sunday from 7:00 AM through 3:00 PM. We are conveniently located near the four corners in Downtown Fremont, Michigan at 14 W Main Street. The Lunch Pail Deli features Boar's Head products, deli meats and cheeses. Stop in for your favorite salad, sandwich, wrap, sub or spud. Try our soup or chili. We have box lunches available with combos like pictured here. Ask about our special delivery for businesses! The Lunch Pail Deli in Fremont, Michigan has delicious and wholesome Boar's Head Meats and Cheeses in our deli cooler available sliced by the pound. Boar's Head Deli Meats are flavorful with the juices locked in. Running late? Call ahead and we can have your meat and cheese order ready to be picked up. We are now located at 14 West Main Street in Downtown Fremont, Michigan. The Lunch Pail is open Monday through Saturday from 7AM to 7PM and on Sunday from 7AM to 3PM. The Lunch Pail Deli & Restaurant's offers deli catering services. Our Catering services are available for your next meeting, luncheon, special event or party. Please call Owner Scott Luchies for more information about our catering menu and for help with planning your next catered event. At the Lunch Pail in downtown Fremont, we have deli sandwiches, soups, spuds & deli meats and cheeses by the pound or slice. Also try our fresh deli made salads. We proudly sell Boar's Head Products. 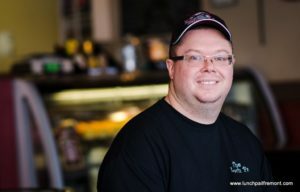 Scott Luchies is the proprietor of The Lunch Pail located at near the stop light in downtown Fremont at 14 West Main Street. Stop by for take out or stay for our inside dining. To place and order or for more information please call us at 231-924-9100. Enjoy our online menu with pictures by clicking on the button to the right or you can view or print Adobe Reader pdf of Lunch & Dinner Menu click here. For Breakfast Menu - click here.